Many years ago Eric Dyer, associate professor of visual arts, worked professionally as an animator by day, and at night created his own experimental films. He explained in his recent TEDxCharlottesville talk that spending very long days in front of a screen left him wanting and needing to find a way to limit his screen time and once again use his hands in the creation of his work. He considered the possibilities of the zoetrope, a device widely popular in the late 19th century for creating the illusion of motion before the arrival of filmed animations. Various configurations of the zoetrope all made static sequences of drawings around a spinning inner cylinder appear to be in motion when viewed through slits. He took this idea with him to Copenhagen, Denmark for a year on a Fulbright Fellowship and upon his return began a course of work that has underpinned his research of the last decade. 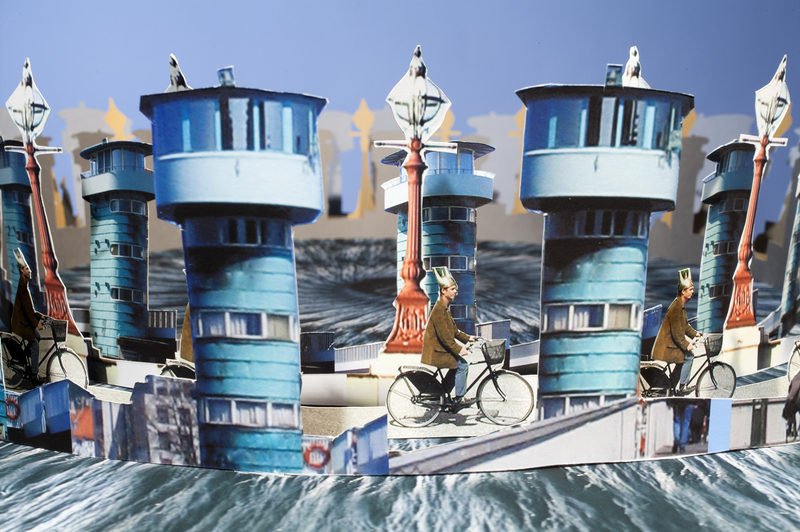 Knippel Louises Bro, from the Copenhagen Cycles project, cut inkjet prints, 2006/2014. An 8′ x 10′ mural of this image will be installed in the new D-E concourse connector at the BWI Airport. Image courtesy of Eric Dyer. “But video flattens sculpture so I tried to imagine a way that animated sculpture could be experienced as such, and as a completely immersive animated sculpture,” said Dyer. 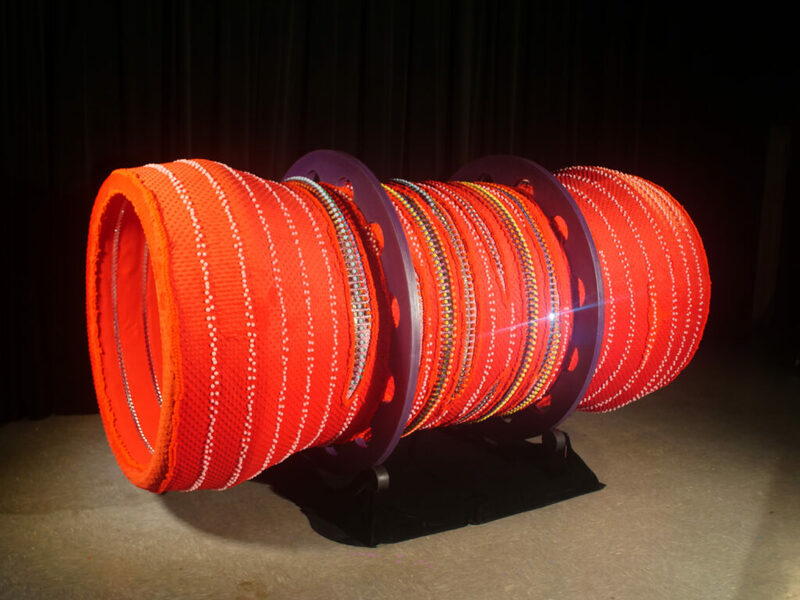 He came up with the concept of a zoetrope tunnel—the zoetrope turned inside out with the viewer inside the cylinder with a handheld strobe walking through the sculpture. Dyer estimates the full-scale realization of the elaborate structure he envisions creating will take years, but in the meantime he has built a half-scale prototype that he uses for animation tests. Implant, 2015. Image courtesy of Eric Dyer. This recognition inspired the creation of his next sculpture, Implant. Dyer describes it as his “science fiction fantasy cure” for his incurable disorder: “a super-magnified medical device that fits around the optic nerve.” With a handheld strobe, viewers explore the animating sculpture and discover thousands of cell-size robots hard at work “weaving in and out of the optic nerve.” Indeed what they are looking at are the tiny static 3D printed and painted elements Dyer has arranged precisely to create the illusion he describes. Dyer shared that “now vision loss has helped to take me away from things that disconnect me from the world. Instead of being sealed off in an automobile, I ride my bike, take buses and trains, and walk a lot. And instead of visually intensive processes in the studio I am also getting outdoors a lot more and using more of my senses.” At the same time, he has been steadfast in exploring experimental processes to create innovative work and the support necessary to do so, receiving a Creative Capital Grant and Guggenheim Foundation Fellowship along the way. Two recent examples of his innovative work are Mud Caves and Octopi. Mud Caves is a multi-layered print piece with an animation hidden within the artwork-a zoetrope laid out flat, revealed only by video. Octopi, commissioned by the Aurora Picture Show and recently installed in Houston, is a 17-foot diameter static installation that pops to animated life on the screen when visitors turn a tiny crank. It’s a new kind of zoetrope (dubbed the “real-time zoetrope”) that Dyer developed through work at UMBC’s Imaging Research Center. A survey of Dyer’s work, ”The Material Instant” is currently exhibited at the Spagnuolo Gallery at Georgetown University and runs through December 11. Included in the exhibition are working zoetropes, maquettes, and videos. An artist talk (5 – 6 p.m.) and reception (6 – 8 p.m.) are scheduled for Thursday, November 17. Watch Dyer’s TEDxCharlottesville talk below, beginning at 2:48:00. Header image: Artist and filmmaker Eric Dyer introduces the zoetrope to the TEDxCharlottesville audience. Photo by Edmond Joe, courtesy of TEDx Charlottesville. CC BY-NC-ND 2.0.